I didn’t always know the difference between rakes. 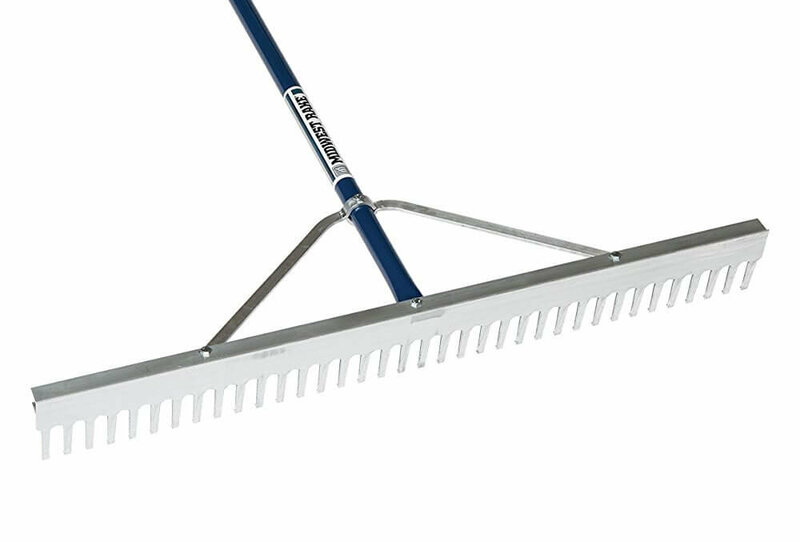 Gravel rake, thatch rake, bow rake, garden rake…a rake’s a rake, right? Well, not entirely…. Rake designs are often subtly different, perfectly tailored for their intended use. A gravel rake is a must if you have any gravel areas and using one can make your life a lot easier. In this article, I’m going to offer some general buying advice alongside my favourite picks from around the web. Click here to jump to our selection of some of the best gravel rakes from around the web. What is a gravel rake? 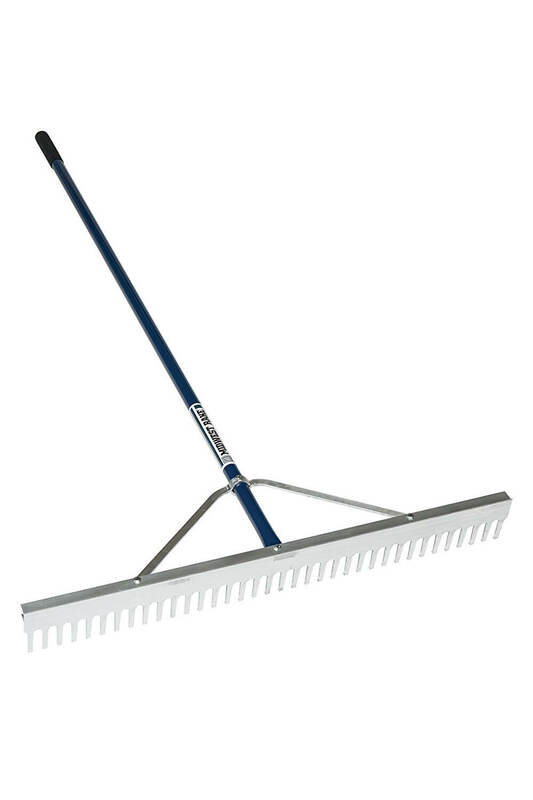 Generally speaking, a gravel rake is used to clear debris from areas of gravel. The heads tend to be made from thick, hard-wearing metal and the individual teeth are widely-spaced, so as to limit disturbance of the rocks. You might be wondering whether or not you can just use your garden rake or thatch rake. Personally, I would advise against doing this. Garden rakes are designed for lawns, and so are nowhere near as solid. 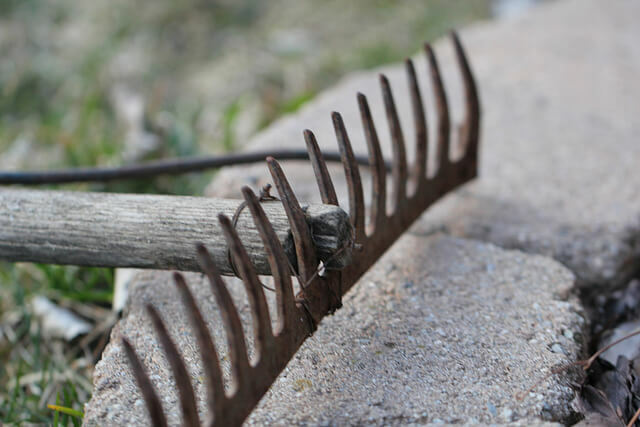 Thatch rakes, though they have wider-spaced tines, aren’t as robust and you will eventually wear down the teeth, making it useless for removing thatch from the lawn. The sharp teeth of both will also likely make a dog’s dinner of your lovely gravel drive. Thatch rakes will wear down and mess up your gravel. It’s probably also worth distinguishing “bow rakes” and “lute rakes” too. 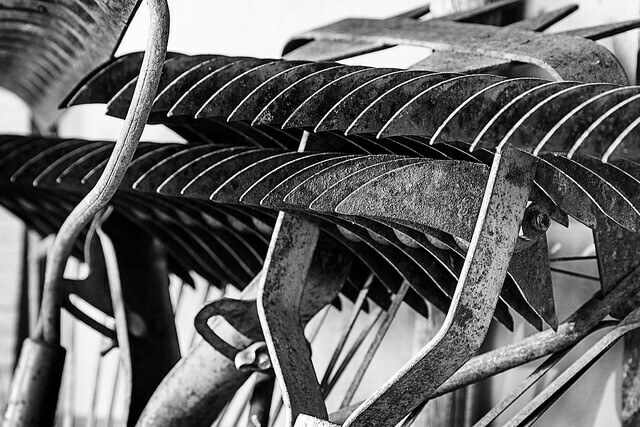 Bow rakes, which are generally narrower and slightly curved, are usually used for breaking up and spreading topsoil and manure, but you can use them on gravel. 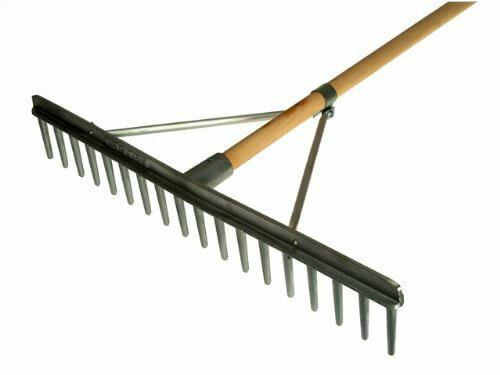 Lute rakes have very shallow teeth and are used for levelling as opposed to cleaning. Do you need a gravel rake? If you’ve got any form of gravel drive or patio, then yes, you need a gravel rake. Raking away leaves with a normal garden rake is ineffective, will mess up your gravel, and wear down the teeth. Because they’re usually very well-made they also last a long time. They’re also relatively inexpensive. Rust-proof metal – Go for a rust-proof metal like aluminium or make sure that steel has been powder-coated. Always clean your tools properly after using them. Strong, sturdy and wide-gapped teeth – Thick metal is always better. The last thing you want is your rake’s teeth snapping off. If relevant, look for carbon steel, which tends be stronger and less likely to chip than alternatives (though this obviously isn’t applicable with models made from other metals like aluminium). A head with “braces” won’t come lose as easily as a screw-in one. Flat “striking edge” – A rake with a head that has a flat side can be inverted and used for levelling, which is always a good option to have. Blunt teeth – Sharp teeth will wear down easily and make a mess of your gravel by gouging it all over the place. This rake from Bully Tools is really nice. It has more or less all of the features I outlined above. It’s “commercial grade” which means that it’s designed to withstand heavy use and it also comes with a limited lifetime warranty, which is always a strong vote of confidence with gardening tools. The head is made from reinforced metal (powder coated steel) and has 16 tines. The handle is made from fiberglass so is also very durable. It’s smaller than most typical gravel rakes but, if you’re looking after a smaller area or storage is tight, it’s ideal. It’s also great for raking soil along with gravel. The 66 in. 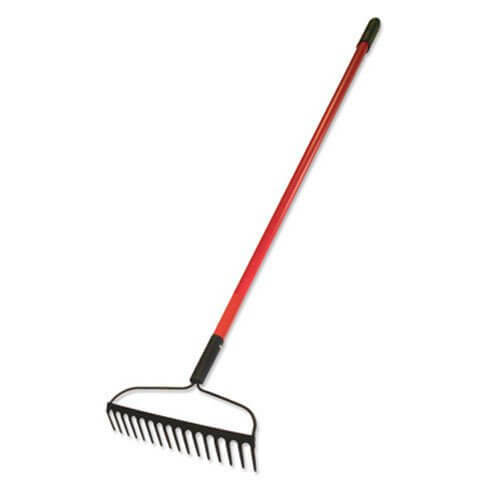 head of this rake from Midwest is more what you would expect from a typical gravel rake. It’s ideal for using over larger areas (if you have a gigantic gravel drive then this one is for you) and it’s impeccably made. The head, which is secured to the handle to prevent it from coming loose, is made from aluminium and so completely rust-proof. The individual tines are also slightly rounded to prevent excessive gouging of gravel and the underlying firmament. The flat edge is also useful for levelling. There’s friction vinyl padding at the top of the handle for extra comfort and grip. If you’re after a rake that’s midway between the two I’ve already listed, then this one from Faithfull could be ideal. It’s got a great rustic feel with the wooden handle, and the 27 in. head (with blunted aluminium tines) isn’t overly big. The tines are quite widely spaced so it will work well with large pieces of debris (particularly leaves). The flat top of the head is good for levelling. Oh, and the braced head is another added bonus too. It’s also very reasonably priced. All in all this is a good product and reviews generally point towards its durability and quality. What are your thoughts? Have you tried any of the selections on the list? Leave a comment below and let me know! Keep your garden beautiful with urbanturnip Garden Rakes, ideal for clearing leaves and garden debris, as well as being perfect for soil preparation too.Thanks for sharing excellent info.Garden rakes and hoes are essential for keeping your outdoor space tidy, and you’ll find a range of them here.There are several types of rakes available for your lawn or garden, and each one is used for a different. It would be helpful if you would state the distance between tines, like for raking gravel out of your lawn after snow plowing. What size gravel will these rakes not capture? Hi Dan, you’re absolutely right. I’ll include the measurements when I update the review. The Midwest one on the list has a width of one inch between the tines.